This is a die-cut Quaker State Motor Oil porcelain sign. This particular Quaker State Motor Oil sign is green and white. 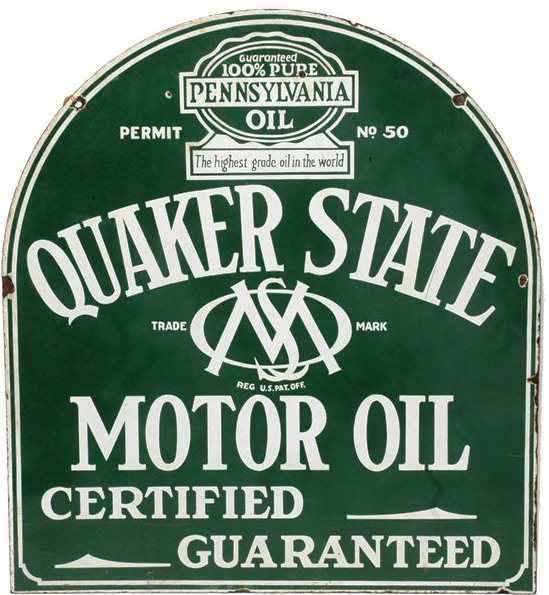 It reads, “Quaker State Motor Oil, Certified, Guaranteed, Permit No. 50, 100% Pure Pennsylvania Oil, The Highest Grade Oil In The World” and features a 100% Pure Pennsylvania Oil emblem at the top of the sign.